Storm Plastics (SA) Pty Ltd was established in 1989 by Marty Bennett, a master plumber and drainage contractor (since retired). We are a South Australian company, with distribution throughout Australia. After much research and development, flexible plumbing fittings were manufactured to alleviate the effects of re-active soils, i.e. broken stormwater and sewer drains, which are the major cause of houses cracking, also revolutionising the repair and cut-ins to sewer and stormwater PVC drains. The Expanda Joint, the first of many fittings, was tested by NATA (National Association of Testing Authorities Australia) and authorised in all states by the various Water Boards. The Expanda Joint complies with Australian Standards and is currently being sold nationally. S.A. companies manufacture the PVC component pieces in South Australia. Poor quality products cost time and money. It is in everyone's interest that the quality of our products is the best it can be. We have dedicated management and staff that strive for perfection in product and service and our track record confirms this to be true. The Swivel Joint was added to our range of products in 1993. Consulting Engineers to the building trade are currently specifying both the Expanda Joint and the Swivel Joint in soil reports involving areas of highly reactive clay soils. Storm Plastics range of Swivel Expansion and Expanda Joints are WaterMark Certified to AS/NZS1260 WaterMark Licence No. WMKA21411. 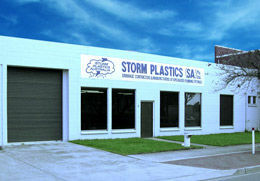 Storm Plastics (SA) Pty Ltd is an ISO 9001 (Reg. No. 1274) Quality endorsed company by IAPMO R&T OceanaMark for WaterMark, ICG & JAS-ANZ for design and manufacturing of PVC DWV flexible fittings for gravity sewer and storm water applications. New Products are continually being developed and Storm Plastics has a large range of plumbing fittings and accessories to meet your requirements. We have worked to change regulations as part of AS2870-2011 and achieved Best Environmental Certification (BEP) on all our WaterMarked Products. We are members of the following bodies; MPA, PIA, MPMSAA, AIBS, HEDRA, FFSA, AHSCA.